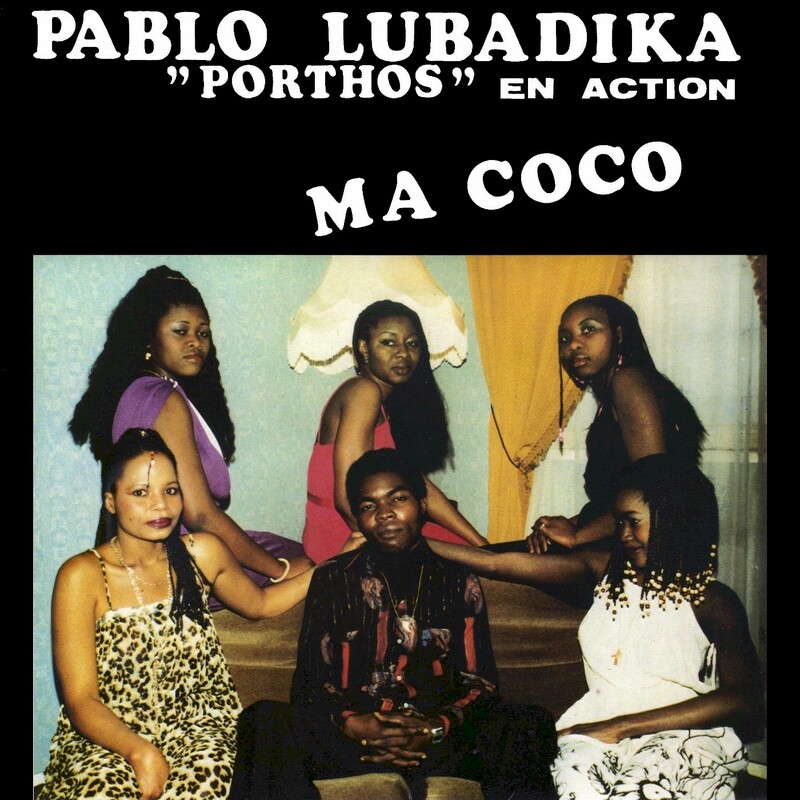 As readers may be aware, I've had a long-time interest in Nigerian music and feature it often here at Likembe. However, all of the music I've posted here has been from the southern part of the country and of this the majority has been from two ethnic groups, the Yoruba and the Igbo. Nigeria, though, is a huge country of 186 million residents, who speak over 500 languages. Of these, along with the Igbo and Yoruba, the largeest nationality is the Hausa, who predominate in the northern part of the country. Nigeria's cultural diversity, a product of British colonial rule, has been a blessing and at times a curse. 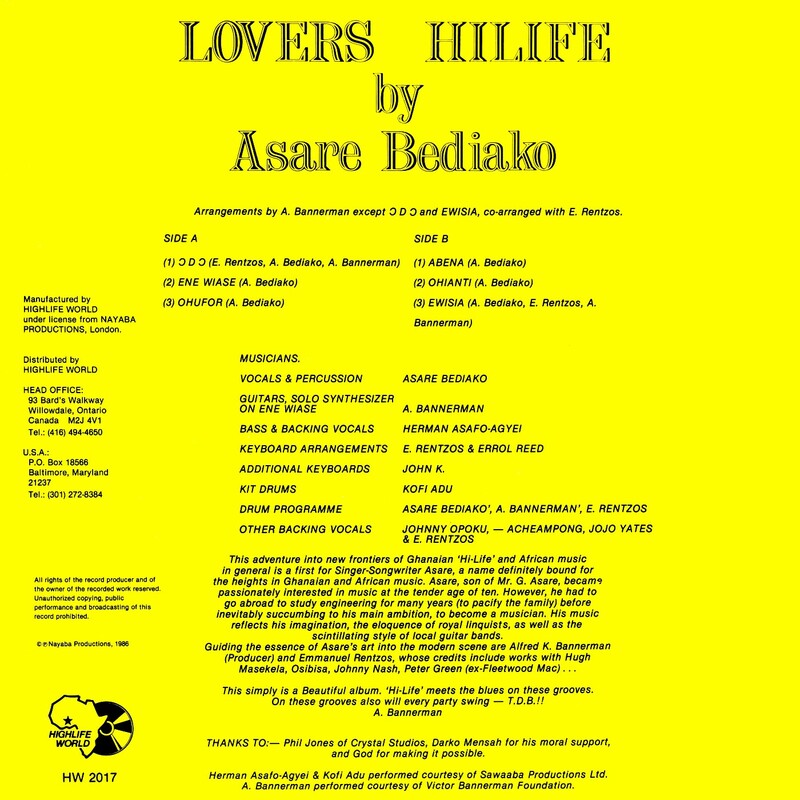 Prior to 1995, the only Hausa music I had heard was a couple of LPs of traditional music - one from the esteemed Bärenreiter Musicaphon series and another issued by the African Record Centre in Brooklyn. In December of that year, during a visit to Nigeria, I was curious to discover more, so together with my brother-in-law boarded a plane to Kano, the largest city in northern Nigeria. 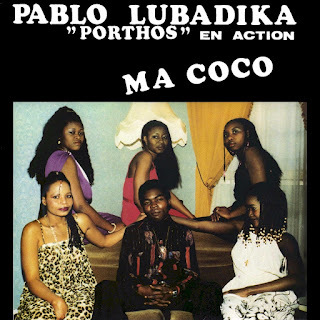 Our cab driver directed us to a music store which had an extensive selection of cassettes, mainly featuring the ever-popular Congolese sound, but also many from Mali and other countries of the Sahel. Notably there were many cassettes from Sudan. I understand this popularity of Sudanese music is a result of pilgrims from northern Nigeria stopping off in that country on their way to and from Mecca. I regret now that I didn't purchase any of these at the time. My main interest was Hausa music, and I was amply rewarded with about 30 cassettes by artists like Alhaji Mamman Shata, Dan Maraya Jos, Audu Waziri Danduna, Sanni Dandawo, and northern Nigeria's greatest diva, Barmani Mai Choge. According to the article "Barmani Choge: The Last of the Strong Ones" by Abubakar Adam Ibrahim (Daily Trust, March 10, 2013), Choge, née Hajiya Sa’adatu Aliyu, was born in the town of Funtua in 1943 or '45 and "...soaked up the cosmopolitan nature of that place that produced the legendary Mamman Shata, and she picked up what had hitherto been a pastime for women in the confines of their houses (the beating of calabashes) and made a successful music career out of it. And all these, while having a dozen children or so along the way. A feat she celebrated in her song 'Gwanne Ikon Allah.' She reportedly married at 15...."
A publicity flyer for a 2008 performance states that "...Barmani Choge popularized the mature Hausa women genre of music called Amada (although she had precedent in the late Hajiya Uwaliya Mai Amada (1934-83)), which started as religious performance by women in their inner apartments, before later becoming secularized in public performances. Barmani Choge’s performances appeal typically to mature women in high society due to her daring – and often experimental – exploration of issues that other conventional women musicians avoid. 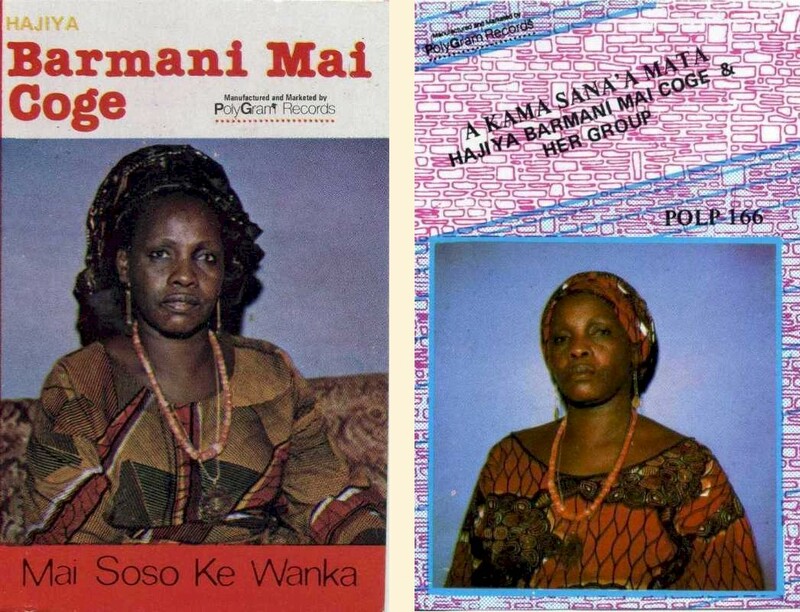 Literally the last of her generation, she popularized the Amada genre of Hausa music which is centered around five upturned calabashes floating on water and played with the hands by rather elderly women...."
Barmani Mai Choge passed away in early 2013, leaving Nigeria a poorer place, but setting an example for the women of the North. I present here two cassettes by Choge - 1987's Mai Soso Ke Wanka (Polydor POLP 162) and A Kama Sana'a Mata (Polydor POLP 166) from 1988. I've been unable to find out much about the lyrics (Google Translate wasn't much help), but I'm passing on what I know. "Gwarne Ikon Allah" - "The Blessings of Multiple Births"
Download A Kama Sana'a Mata as a zipped file here. A future post will feature the music of northern Nigeria's foremost male singer, Alhaji Mamman Shata. 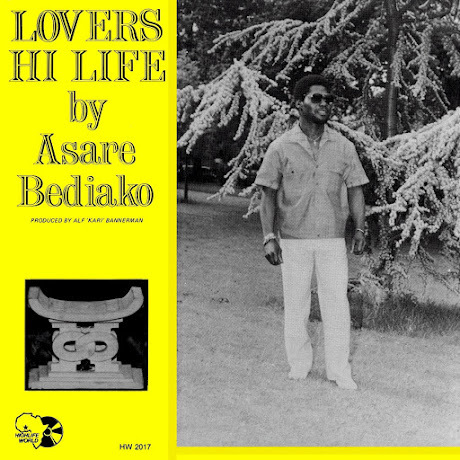 One question I had at the time of my 1995 visit was whether there was any analog in northern Nigeria to the popular musical styles of the South - highlife, jùjú, fújì and so forth. 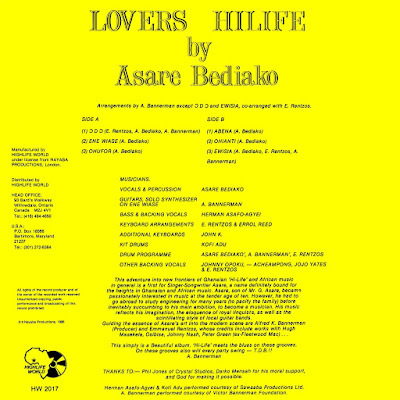 There were one or two Hausa highlife ensembles back in the '60s and '70s, and southern Nigerian artists will occasionally record songs in the language, but the answer, at least in 1995, seemed to be "no." The subject matter may involve modern concerns, but the music of Choge, along with the other artists I've mentioned, is definitely within the classic framework, utilizing percussion, one-string lutes and other traditional instruments. "...Hausa tradtional musicians began to play cover versions of popular Bollywood soundtrack music...It was not until 1990, and the introduction of VHS, that the first Hausa language films were made in Kano, and Kannywood was born. Naturally, producers turned to the influences of films they had been watching for generations. Featuring plots of forced marriages and love triangles - indeed, sometimes copying the plot directly from the original Hindi films - these new homemade creations also retained the most popular feature of Bollywood: song and dance. "...as in Bollywood, soon the film songs came to eclipse the films themselves. It was not long before songs began to precede the film. In these polyphonic duets, men and women often would exchange words with one another, throwing barbs or providing romantic innuendos. Stylistic elements began to emerge in Hausa popular music, with the frenetic rhythm of a drum machine and synthesizer riffs. 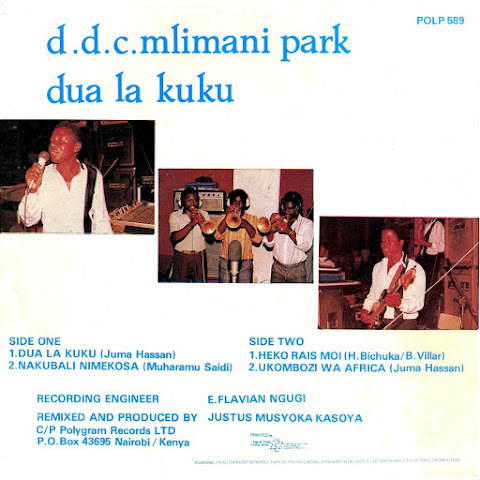 Autotune, the pitch correcting technology, joined the toolkit, offering a chance to compete with the high octave voices of Hindi film, becoming a signature sound of the film music..."
Here's another in Likembe's continuing series of releases by Tanzania's legendary DDC Mlimani Park Orchestra, this one a little-heard LP from 1989, Dua La Kuku (Polydor POLP 589). 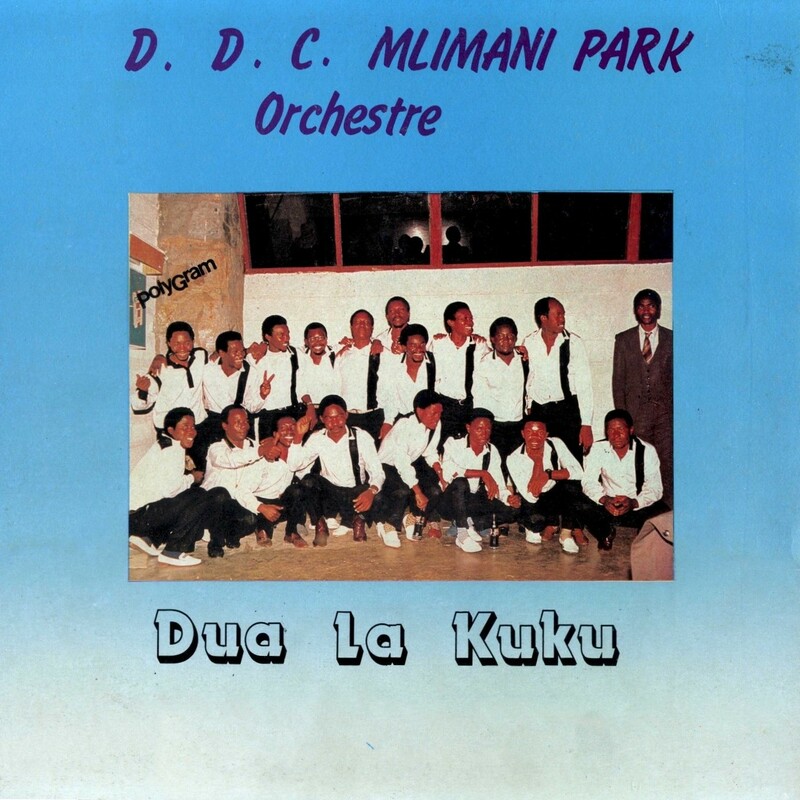 I can't say too much about this one - contrary to the photos on the album sleeve, it seems to feature a stripped-down lineup for the band, at least their sikinde sound isn't as "beefy" as usual. It's fine music nonetheless. Tucheze sikinde! "Let us dance sikinde!" Download Dua La Kuku as a zipped file here.